Cairo is the capital of Egypt and the largest urban center in Africa and the Middle East. It is the third largest metropolitan capital in the Muslim world after Jakarta and Istanbul. Cairo occupies the sixteenth place globally in terms of expansion of urban areas. Its population of 16 million represents a quarter of the population of Egypt and is home to nearly 70% of the population of Greater Cairo. 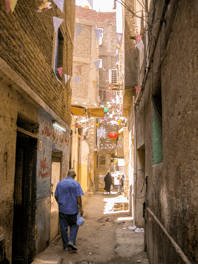 Informal neighborhoods dominate Greater Cairo dramatically, especially in its historic heart and on the outskirts of the city. 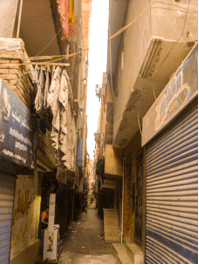 Informal areas amount to approximately 60% of urbanization in Greater Cairo. القاهرة هي عاصمة مصر .وتعتبر من اكبر المناطق الحضرية في افريقيا والشرق الاوسط وتعد ثالث اكبر عاصمة حضرية في الدول الاسلامية بعد (جاكرتا واسطنبول ) وتحتل القاهرة المركز السادس عشر عالميا من حيث اتساع المناطق الحضرية ويبلغ عدد سكان القاهرة 16 مليون نسمة وهو ما يمثل ربع سكان مصر ويسكن ما يقرب من 70% من سكان القاهرة الكبري في المناطق اللارسمية حيث اصبح الاسكان اللارسمي هو الاسكان المهيمن علي القاهرة الكبريوتنتشر المناطق اللارسمية في القاهرة الكبري بصورة كبيرة وخاصة في القلب التاريخي وعلي اطراف المدينة وتبلغ المناطق اللارسمية ما يقرب من 60 % من العمران في القاهرة الكبري. Informal settlements can be defined by their origins: whether they developed on agricultural land or desert (Map Number 1). Informal urban areas have arisen under without law and regulation since the 1950s. These areas are characterized by the complete absence of urban planning, non-existent or scarce basic services, and lack of mobility and transportation access. يتم تعريف المناطق اللارسمية علي حسب نوع نشاة وتطور المناطق اللارسمية سواء كانت علي اراضي زراعية او اراضي صحراوية (خريطة رقم 1 ).وبشكل عام فان المناطق اللارسمية هي المناطق الحضرية التي نشات في ظل غياب تام من القوانين والتشريعات والتي كان بداية ظهورها في الخمسينات من القرن الماضي . وتتصف هذه المناطق بالغياب التام للتخطيط العمراني وتنعدم او تظهر بندرة الخدمات الاساسية في هذه المناطق ومن هذه الخدمات التنقل والمواصلات. Mobility is one of the most pressing problems facing the world today. This problem is compounded in Egypt’s case in particular, where public transport is absent from even many of the planned areas in Cairo, such as the Sixth of October and Tenth of Ramadan City. If public transportation is absent in these areas, how can we call these planned areas planned?! 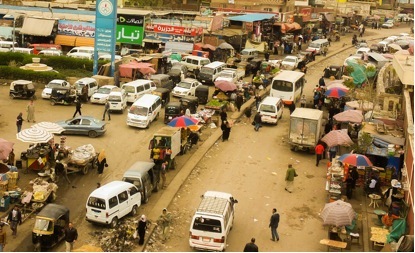 Based on the huge increase in the informal settlements in Greater Cairo, Egypt in particular should research and contribute to the search for solutions to reduce the challenges faced by Cairo.Cairo faces many challenges in the field of mobility, including the dominance of private cars compared to public transit, the marginalization of pedestrian traffic and lack of infrastructure. Because of the absence of these services, residents of informal settlements have taken it on themselves to provide transport. Common in these areas are the Altoctouk (Indian rickshaw or “tuktuk” ) and the private microbus. Both these means of transport produce exhaust that is a major threat to the environmental health of these areas. With the increasing number of residents in informal neighborhoods, and narrow roads and streets as wide as 3 meters only (Picture No. 1), transportation currently available is not a reliable long-term solution. و تعد مشكلة التنقل من اهم المشاكل التي يعاني منها العالم في الفترة الحالية بوجه عام وتزداد المشكلة تعقيدا عند النظر علي الصعيد المصري بوجه خاص .حيث تغيب وسائل النقل العامة عن كثير من المناطق المخططة في مصر مثل مدينة السادس من اكتوبر والعاشر من رمضان. واذ تندر المواصلات العامة في هذه المناطق المخططة فكيف بالمناطق غير المخططة ؟!! فبناء علي الازدياد الضخم للمناطق اللارسمية في مصر وفي القاهرة الكبري بشكل خاص فيجب النظر الي هذه المشكلة والبحث عن حلول تساهم في تقليل التحديات التي تواجهها القاهرة. The study of movement in informal areas built on the Agricultural Land is important not only because these settlements lack many services, but because these areas are distinguished by paths of canals and drains that existed during agricultural use. For example, the former main canal was turned into Main Street, and small canals and drains became side streets. Buildings that arose on the sides of these small waterways can thusly be as small as 3 or 2 meters. Movement in these areas is consequently a big problem. A small Altoctouk (tuktuk vehicle) may traverse the spaces, but the huge increase in the number of Altoctouk are suffocating these narrow streets.Egyptian cities in general and in particular their informal areas are facing a traffic crisis evidenced by the level of suffocation, noise, pollution, road accidents, injuries, and the absence of justice for most of Cairo’s population who live in the major informal areas. Unfortunately, the state does not consider the issues of mobility and transportation in informal areas a priority. This is in contrast to other problems such as the provision of adequate housing for the residents of these areas. The state will help in solving the problem of housing in some cases, but does not interfere at all in providing the means for movement within them. As is the case in many developing countries where informal settlements are found, the government avoids the issue of public transportation in these areas, leaving it to the private sector to solve this problem. In addition to not providing public transit services, the city also fails to provide police officers to control traffic control security in these areas. This absence of policing led to the serious violations of Altoctouk private microbus drivers who suffer in the main streets in the informal areas. (Picture No. 2) and repeatedly in these areas where Taatdkds several means of private transportation Altoctouk private microbus and. Street vendors who occupy the pavements encroach or roadways and impact the condition of the main street. In addition to this show, piles of garbage fill up the streets. ان من الاهمية دراسة حركة التنقل في المناطق اللارسمية التي نشأت علي اراضي زراعية ليس فقط لانها تفتقر الي كثير من الخدمات ولكن لان هذه المناطق لها طبيعة خاصة حيث ان النسيج العمراني بها يكون ناتجا عن مسارات الترع والمصارف التي كانت موجودة من قبل حيث تتحول الترعة الرئيسية الي الشارع الرئيسي في المنطقة وتتحول الترع والمصارف الاصغر الي الشوراع الجانبية وبالتالي تتحول قطع الاراضي الي مباني ونظرا لان الترع القديمة كانت مجرد ممر مائي صغير قد يصل عرضه الي 3 امتار وفي بعض الاحوال 2 متر فقط فان التنقل في هذه المناطق يعد مشكلة كبيرة رغم ان التوكتوك صغير الحجم بالمقارنة بالسيارة ولكن الازدياد الضخم في عدد التوكتوك ادي الي اختناق هذه الشوارع الضيقة . فان التنقل ووسائل المواصلات تعتبر المشكلة التي لا تتدخل الدولة لتساهم في حلها علي العكس من المشاكل الاخري مثل توفير مسكن مناسب لسكان هذه المناطق فالدولة تساعد في حل مشكلة الاسكان في بعض الاحيان ولكن لا تتدخل علي الاطلاق في توفير وسائل تنقل داخل هذه المناطق علي الرغم من ان معظم الدول النامية والتي بها عدد كبير من المناطق اللارسمية نجد فيها تدخل لحل مشكلة التنقل في هذه البلاد ولا نجد هنا تدخل حكومي لتزويد هذه المناطق بالمواصلات العامة حيث تركت الحكومة حل هذه المشكلة للقطاع الخاص. و التدخل الحكومي في هذه المناطق ليس فقط في توفير وسائل مواصلات ولكن ايضا في تزويد هذه المناطق باي من افراد الشرطة الذين ينطمون حركة المرور فغياب الامن والرقابة في هذه المناطق ادي الي مخالفات شديدة من سائقي التوكتوك والميكروباص الخاص وتعاني الشوارع الرئيسة في المناطق اللارسمية من تدهور عام(صورة رقم 2)ومتكرر في هذه المناطق حيث تتدكدس عدة وسائل مواصلات خاصة من التوكتوك والميكروباص الخاص ويزيد عليها الباعة الجائلين الذين يشغلون الارصفة غير ان حالة الشارع الرئيسي تكون متدهورة بشكل لا يوصف وبالاضافة الي هذا تظهر اكوام القمامة التي تمليء الشوارع. Altoctouks have become most prevalent in these areas (Picture No. 3) where they are a major alternative to taxis. Altoctouks are cheap and able to access areas with narrow streets, which may not be reached by a normal car. Most of the population of the region rely on Altoctouks to get around. But the main problem in the Altoctouk system is that the state refuses to register these vehicles. Therefore there are no licenses for these vehicles, leaving Altoctouk drivers in the complete absence of all control. Altoctouk drivers may not have a license, so it is common to find a lot of kids between ten and eighteen driving those vehicles. terrible for the spread of Altoctouk prepared and increased dramatically speed there to make a strong presence of the busiest. Altoctouks are a fact of life in Cairo. What is the alternative? 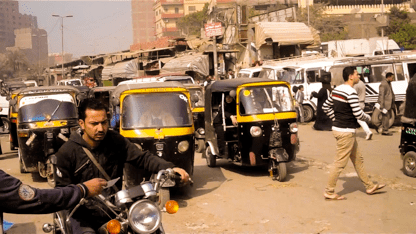 In an attempt to provide mobility to solutions for informal areas, experts are trying to provide alternative solutions to the motorized tuktuk. 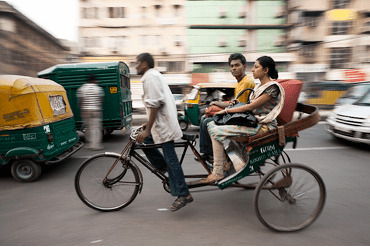 In India, the government has encouraged new projects in several Indian cities to revive the rickshaw bike rather than the tuktuk. Cycling reduces fuel consumption and therefore reduces the carbon dioxide emissions that harm the environment. 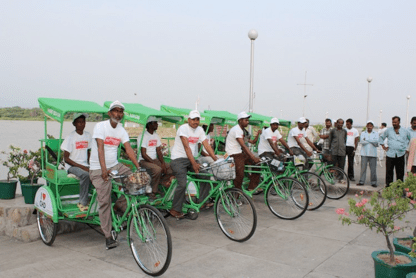 Rickshaw bikes contribute directly to purify the air and also provide job opportunities for poor laborers while also improving the health of drivers of these bikes. A team of engineers from Aktar Indian has worked to develop bikes that are lighter and easier to drive. Aktar has been supplying several Indian cities, including Delhi, Agra and others, with more than three hundred thousand bicycle. Used widely in informal areas and Taatattabr, these bikes are an excellent way to make short trips, especially for the elderly and women. في محاولة للوصول الي حلول للتنقل في المناطق اللارسمية يحاول خبراء التنقل من توفير حلول بديلة للتوكتوك الهندي ففي الهند قامت الحكومة بتشجيع مشروعات جديدة في اكثر من مدينة هندية لاعادة احياء الدراجة الريكشو التي تعتمد علي التبديل بدلا من الريكشو (التوك توك ) الذي يستهلك الوقود ومن اهم ما يميز هذا النوع من الدراجات هو التقليل من استهلاك الوقود وبالتالي التقليل من انبعاثات ثاني اكسيد الكربون التي تضر بالبيئة فهو يساهم بطريقة مباشرة بتنقية الجو وكذلك يوفر فرص عمل للطبقات الفقيرة ويحسن من صحة سائقي هذه الدراجات و قد عمل فريق من المهندسين الهنديين علي تطوير هذه الدراجات بحيث اصبحت اخف في الوزن واسهل في القيادة ومريحة اكتر في الاستخدام وقد تم تزويد عدة مدن هندية منها نيودلهي واكرة وغيرها باكثر من ثلاث مائة الف دراجة…حيث تستخدم في المناطق اللارسمية وتتعتبر هذه الدراجات وسيلة ممتازة في الرحلات القصيرة وخاصة لكبار السن والسيدات. The most famous city that relies on the bike rickshaw is Fazilka in the north-west of the state of Punjab. Here a pilot called the Eco Cabs project created a network of bike taxis that can be hailed by phone. The idea of the project, which began in 2008, is changing the means of transportation in the city, which grew by by nearly 67, 000 people in the last three years. Eco Cabs had resounding success in the city of Fazilka. The project has received the Indian government award as the best project for sustainable transport and as a result of the success has been applied in more than 22 cities within the Indian state of Punjab, in addition to the union territory of Chandigarh. ومن اشهر المدن التي تعتمد علي الدراجة الريكشو مدينة Fazilka في الشمال الغربي لولاية البنجاب حيث تم تجربة مشروع استرشادي لاستخدام الدراجة الريكشو سمي هذا المشروع The Eco Cabs projectوهو عبارة عن عمل شبكة من الدراجات التي يمكن طلبها عن طريق الهاتف وكانت فكرة المشروع الذي بدأ في 2008 هو تغيير وسائل المواصلات في المدينة التي يبلغ عدد سكانها الي ما يقرب من 67 الف نسمة في خلال ثلاث اعوام وقد نجح هذا المشروع نجاحا باهرا في مدينة Fazilkaوقد حصل المشروع علي جائزة الحكومة الهندية كأفضل مشروع للنقل المستدام ونتيجة نجاح هذا المشروع تم تطبيقه في اكثر من 22 مدينة هندية داخل ولاية البنجاب وبدأ تطبيقه في اقليم اتحاد شانديغار. Can Cairo follow India’s example of sustainable and appropriate transport? The question remains: is the use of bicycles a solution in informal areas, despite the absence bike path infrastructure and places to park, as well as harassment of bicycle users since cycling culture is still strange in Eastern societies? True, bikes culture does not exist yet in Cairo, but there is still a glimmer of hope in terms of initiatives that call for bike use. 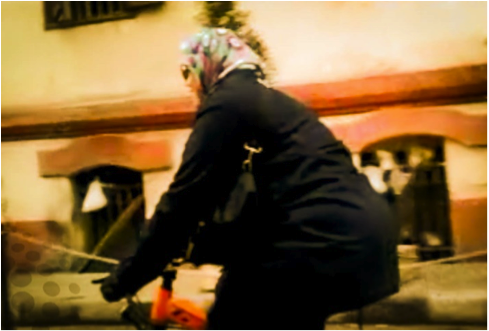 Just days after taking office, the new Egyptian President announced the government’s first-of-its-kind initiative to encourage cycling (Picture Number 6). 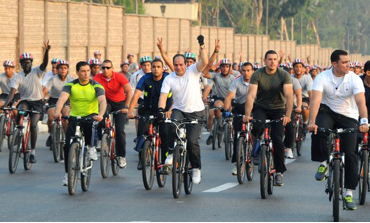 The president participated in a bicycle marathon along with other government officials, artists and intellectuals, and called for the Egyptian people to use bicycles in their daily lives. However, this was just an initiative and so far has not had the actual impact of the state promoting the use of bicycles. نعم الدراجات اصبحت ثقافة غير موجودة ولكن مازالت هناك بارقة امل حيث ظهرت المبادرات التي تنادي باستخدام الدراجة فبعد نجاح الرئيس المصري في الانتخابات الرئاسية تفاجأ المصريين بالرئيس المصري بعد ايام من توليه الرئاسة يقوم بمبادرة حكومية هي الاولي من نوعها لتشجيع ركوب الدراجات (صورة رقم 6)حيث قام بعمل ماراثون للدراجات بمشاركة المسئولين الحكوميين والفنانين والمثقفين ودعا فيه الشعب المصري الي استخدام الدراجات في حياتهم اليومية ولكن كانت هذه مجرد مبادرة لم يكن لها الاثر الفعلي من الدولة في تشجيع استخدام الدراجات. 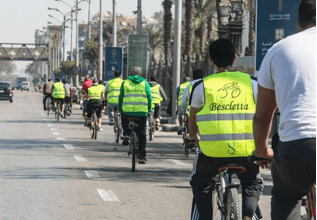 The private sector remembers initiative “Bisklth Egypt,” a national sports initiative organized by Cycle IGBT in Cairo and Alexandria to visit Egyptian landmarks, encourage tourism and support the tourist places throughout the year. 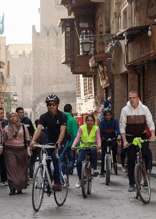 Cycle IGBT continued this initiative for 3 months to stimulate domestic and foreign tourism, and aimed to visit several tourist sites such as the mosque Ahmed Ibn Tulun, Mosque Amr Ibn El-Aas, and the Coptic Museum. The initiative offered those who did not have a bike suitable for the trip to borrow bike, for a nominal fee. The initiative intended to encourage cycling as an alternative to cars. 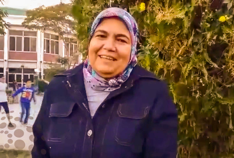 اما المبادرات الخاصة اذكر مبادرة ” بسكلتة مصر ” وهي مبادرة قومية رياضية وطنية تنظمها سايكل إيجبت فى القاهرة والإسكندرية لزيارة معالم وآثار مصر وتشجيع السياحة ودعم الاماكن السياحية طوال العام واستمرت هذه المبادرة لمدة 3 أشهر بهدف تنشيط السياحة الداخلية والخارجية وكانت تستهدف زيارة عدة اماكن سياحية مثل مسجد احمد ابن طولون ومسجد عمرو ابن العاص والمتحف القبطي وهذه المبادرة تنظم فعالية لقيادة الدراجات اسبوعيا تنطلق من اماكن مختلفة كما توفر لمن لا يملك دراجة دراجة مناسبة بسعر رمزي والهدف منها بتشجيع ركوب الدراجات كبديل للسيارات . وتتابع :” أصبحت الدراجة وسيلتي الوحيدة والمريحة للذهاب إلى أي مكان، ولم أعد أستخدم السيارة نهائيًا”. المثال الثاني :يحيي عبد القوي الكردي شاب مصري كان يعمل موظفا في الحكومة المصرية ثم تقدم باستقالته من اجل تأسيس شركته الخاصة وقام من اجل تأسيس الشركة برحلة طويلة بالدراجة دار فيها علي 20 مدينة مصرية قطع خلالها ما يقرب من 2500 كيلو من اجل تشجيع الناس علي استخدام الدراجة وتعليم الناس الأوبن سورس و اللينكس والتعلم عن سيكولوجية الطلبة والتعليم من أكتر من 2000 طالب حوالي 20 مدينة مختلفة خلال سنة ونص متواصلة. يقول يحيي “هدفي نشر ثقافة التنوع من خلال إطفاء فلسفة وأفكار مفتوحة المصدر، وهذا يجعل الناس تغير طريقة تفكيرهم. وكبداية لبدء برنامجنا قمت برحلة تعليمية مجانية مع دراجتي لمدة 3 أشهر. دربت خلالها 1000 شخص، خلال الدورة التي استمرت لمدة 5 أيام في كل محافظة، فقد قطعت 1750 كم بدراجتي “. 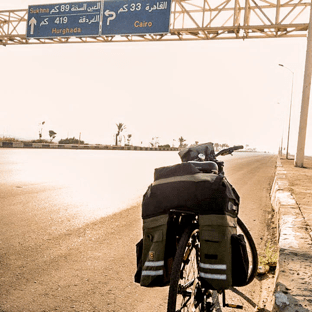 Aktar won the United Nations Volunteer Award for the Alexandria Aswan trip, during which he trained more than 1,000 people for free in 14 cities within 3 months.These initiatives and many others are beginning to change the culture of cycling Egyptians. فاز يحيي بجائزة الأمم المتحدة volunteer award عن رحلة الإسكندرية أسوان بالعجلة التي قام خلالها بتدريب أكتر من 1000 شخص مجاناً على مستوى 14 مدينة خلال 3 شهور.تعد هذه المبادرات والامثلة وغيرها الكثير بداية انطلاقة لتغيير ثقافة الدراجات لدي المصريين . But the state must exploit the emergence of these initiatives and encourage them through a redesign of the city to become more pedestrian and bicycle-friendly. Bicycles are now is the nucleus of this development. We should measure developed cities by the percentage of the use of bicycles in exchange for the car as well as the proportion of public transport in return for private transportation. What we need now is the environmentally friendly city, which relies on walking, riding bikes and public transportation, and operates on renewable energy. The city should be devoted to efforts to restore the main streets with added tracks and infrastructure for bicycles—to prioritize bicycles, not the car, and the streets. Make streets safer for cyclists and convert some of the main streets to pedestrian and bicycles-only, and grow public squares and green areas to encourage all public activities and social interaction. تعد هذه المبادرات والامثلة وغيرها الكثير بداية انطلاقة لتغيير ثقافة الدراجات لدي المصريين .ولكن يجب علي الدولة استغلال ظهور هذه المبادرات وتشجيعها عن طريق اعادة تصميم المدينة بحيث تصبح اكثر للمشاه والدراجات فالمدن تتغير والدراجة اصبحت الان هي نواة هذا التطوير فقياس المدن المتطورة اصبح عن طريق نسبة استخدام الدراجات في مقابل السيارة الخاصة وكذلك نسبة المواصلات العامة في مقابل المواصلات الخاصة ولهذا فالمدن التي نحتاج اليها الان هي المدن الصديقة للبيئة والتي تعتمد علي السير وركوب الدراجات و تعتمد علي المواصلات العامة التي تعمل بالطاقة المتجددة ويجب تكريس الجهود لاعادة تصميم الشوارع الرئيسية في المدن بحيث يتم اضافة مسارات و بنية اساسية للدراجات وان تكون الاولوية للدراجات وليست للسيارة وان تكون الشوارع الرئيسية اكثر امانا لقائدي الدراجات و تحويل بعض الشوارع الرئيسية الي مشاه ودراجات فقط و زيادة الساحات العامة والمناطق الخضراء وذلك كله لتشجيع الانشطة العامة والتفاعل الاجتماعي . Sims, David. Understanding Cairo. The American niversity in Cairo, 2010. Oliver Inder and Sir David King. 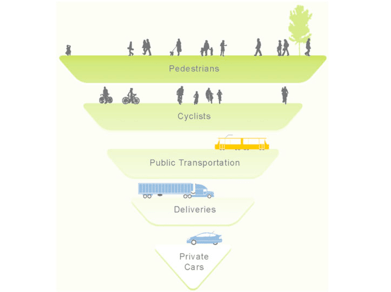 Transport & the environment addressing the sustainable mobility. Springer, 2012. Khalil, a gift Essam : ” نحوتعريفموحدللمناطقالعشوائيةفىالمنطقةالعربية ” , المؤتمرالدوليالثاني Quality of life – Nhomstqublavdil 0.2012. About the Author: Hisham Mohammed Jamal is an architect and recent graduate of the Faculty of Engineering, Cairo University. He is now a student at the postgraduate level and works as an architect in the novice single architectural offices in Egypt. Hisham is interested in the development of informal areas and during the period of study at the college participated in several projects in informal areas, including The Ecocitizen World Map Project. التعريف بالكاتبهشام محمد جمال …معماري حديث التخرج , تخرج من كلية الهندسة جامعة القاهرة عام 2014 والان هو طالب في مرحلة الدراسات العليا و يعمل كمعماري مبتديء في احد المكاتب المعمارية في مصر مهتم بمجال تطوير المناطق غير الرسمية وشارك اثناء فترة دراسته في الكلية في عدة مشاريع لتطوير المناطق غير الرسمية ومنها مشروع Ecocitizen World Map Project.